the greatest thing about making your own bread is the creativity and control. 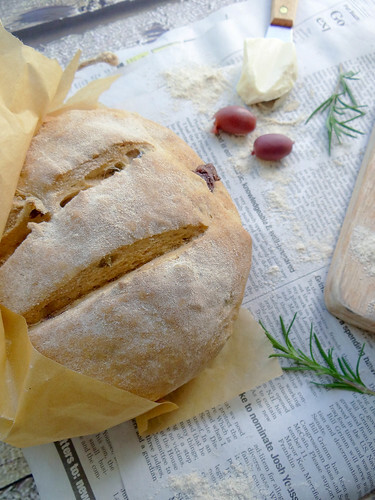 you get to decide what goes in and what style loaf you want to create. as you can clearly see i had a craving for a rosemary olive loaf - the salty briness of the olives with the woody earthy rosemary had my mouthwatering before i even popped these beauties in the oven to bake. bread making is relatively easy- as i have said a million times over the more you do it, the better feel you have for the process and soon enough you will find yourself not over thinking the process. my mom shares the same bread addiction- as does my aunts, one of which who actually gave away her bread making machine because she would end up eating the entire warm loaf in a day. so anytime i make a double batch of bread i bring the extra loaf to my mom, who more than gladly accepts. my favorite part of the process is the kneading. for me it is one of the most soothing activities - my mind clears and i simply focus on the task at hand, typically with a good pandora station rambling on in the background. a few simple ingredient will yield you something incredible, tasty and not to mention much less expensive than any store bought "artisan bread" unless that is if it was purchased from your lovely local baker/bread maker. 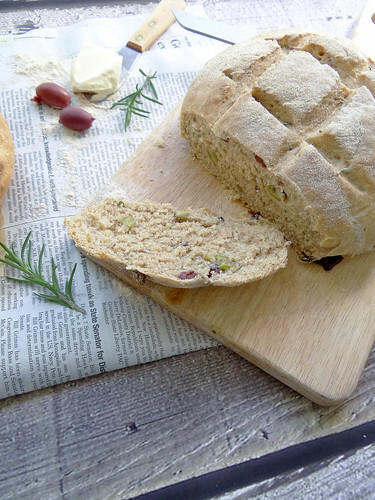 do you make your own bread - if so, do you take the warmer months off? 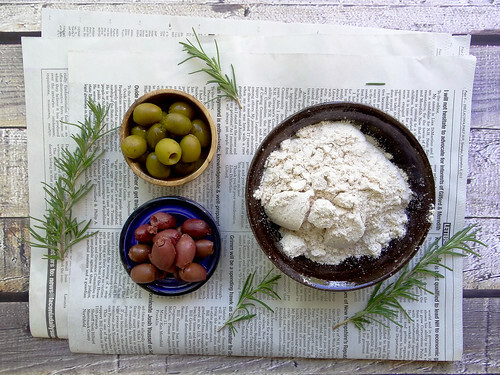 with a wooden spoon stir in 4 cups flour, salt, olive oil & olives until dough forms a wet loose ball. in a medium bowl greased with olive oil turn dough into bowl and flip around once so top and bottom are coated with olive oil. cover and place in a warm area free from drafts and allow to rise until double in size - about 1 hour. after first rise, punch dough down and allow to rest, covered for 10 minutes. on a lightly floured work surface turn dough onto surface and divide into 2 equal pieces. shape each piece of dough into a rough circle - place a parchment lined baking sheet, cover and allow to rise of for 40 minutes - lightly dust tops with flour. with a sharp knife cut three slits into the top of each dough ball. bake bread in a 425* pre heated oven for 15-17 minutes - until bottoms are golden brown and sound hollow when tapped. remove from oven and allow to cool for at least 20 minutes prior to slicing. Awww thanks Caitlin! I love the rythem of making bread....and eating it too! Someday I will get around to trying out a gluten free version - they just scare me, I see Richa's GF Breads and they are so amazing! Thanks Ella! I cannot get enough of homemade bread this time of year - so yummy and when it is baking it makes the whole house smell so so good! 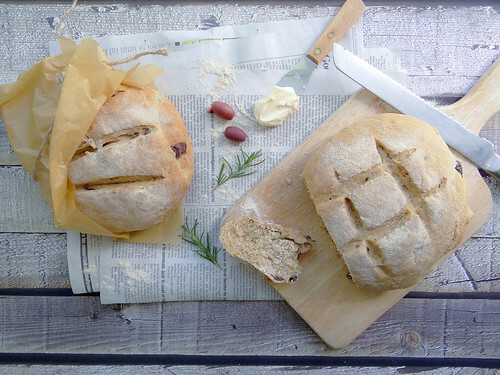 This bread looks incredible- and I must be your long lost cousin because I have a bread addiction too! If there's freshly baked bread in the house, I have to keep taking tiny, skinny slice after tiny, skinny slice, trying to "make a straight,even cut" until there is no bread left. So I don't often bake bread. This one is begging to be made, though. If I only have packets of yeast, rather than a jar, how many packets would you suggest I use? I know right! (i love olive tapenade by the way!) Isn't funny how we think if we just eat little slices throughout the day it seems to be better- hahaha I gave up on that method a long time ago - know I just tear off a big warm hunk and go to town! Bread making just fulfills all the senses. I haven't made bread in a while, it is so comforting and perfect for the chilly drizzly weather coming up. This looks beautiful. 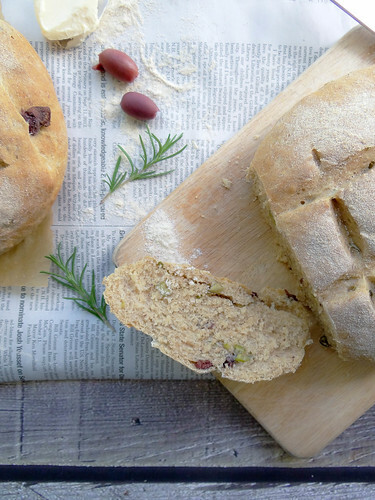 Olives in bread are so delicious- I love the pops of savoury deliciousness. Paired with rosemary, it doesn't get much better! Thanks Gabby! 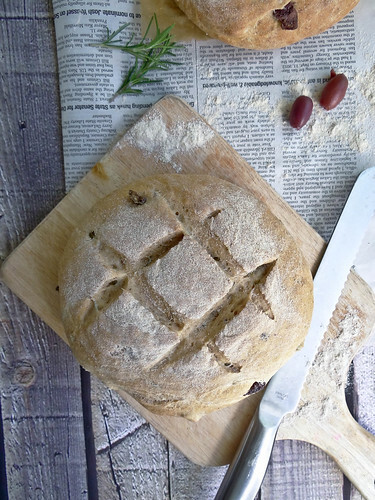 The rosemary smelled and tasted so good - with the salty olives I was in bread heaven! You are so smart Richa - I am also in love with homemade bread....this summer I did find an awesome bread maker with vegan breads at the Farmers Market - they had the best Ciabatta bread - SO GOOD!!! I think homemade bread should totally be in you very near future....or at least after MoFo!!! I only make bread every once in a long while! 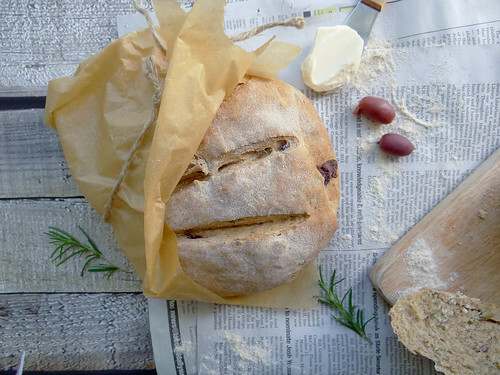 Of course, I do have a close friend who makes sourdough and frequently has a second loaf to give away... :) This rosemary and olive bread sounds amazing! I want a big hunk of it with a bowl of some intensely orange soup--carrot, sweet potato, squash, you name it. Mmmmm sourdough - those kind of friends are good to have...I need to get some motivation to start a starter for sourdough! mmmm orange carrot soup sounds so good! Love this, I bake ALL my own bread. I've always made bread, but since going vegan, it's harder to find bread and I've concocted recipes that I can do that are whole grain in the bread maker that bake up quicker than going to the store and back. 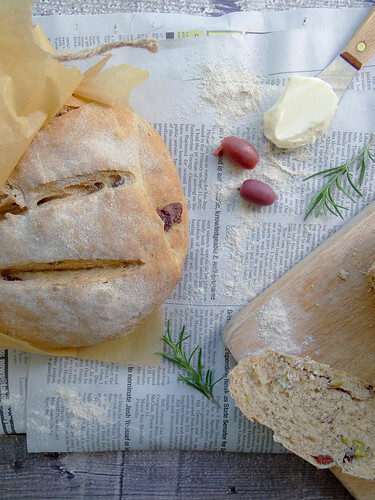 I need to try this peasant bread. 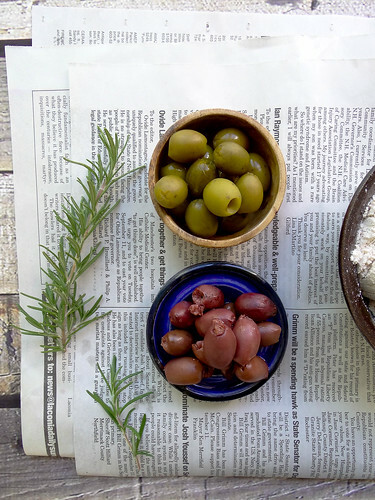 I adore olives! You are so AMAZING Somer - all your bread!? Crazy Girl, you are such an inspiration...I need to get my pretzel buns on in the Kitchen - this weekend for sure!! oh my gosh YUM!! I know, i'm excited to finally be able to turn on the oven again! haha have a great week! I know right! I miss baking - even though summer cooking was fun I love how the whole house gets all warm and smells so good when you are baking!! Oh my bready heaven! Soooooo...you are coming up with the de-glutenized version tomorrow, right? RIGHT?!!! or maybe Richa....as you know she is the GF Bread making queen!!! GF breads scare me, sometime soon I should get over it and geet my buns in the kitchen and start experimenting with a few gf breads!